By Xah Lee. Date: 2009-08-24 . Last updated: 2018-06-09 . 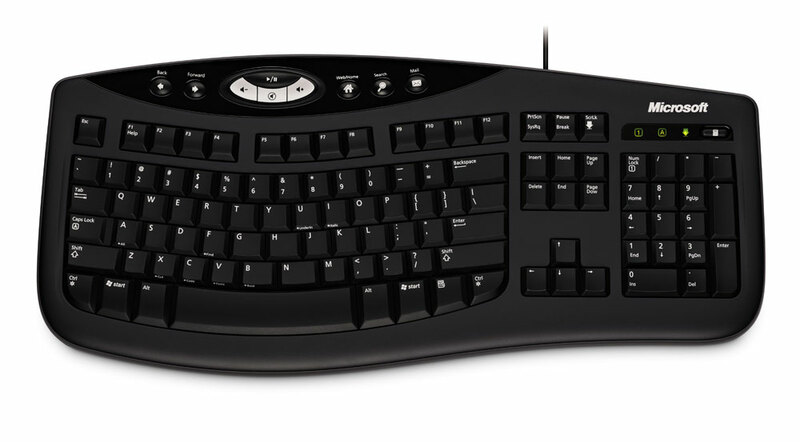 Microsoft Comfort Curve Keyboard 2000, came out in 2003. Update: this keyboard is well-known for its key failure. See below for comment and how to fix. Recently i bought the Microsoft Comfort Curve keyboard 2000. This is a fantastic keyboard. If you find those split ergonomic keyboard too much, or if you prefer the laptop-style flat keys, then this is the keyboard to get. Consider the price, it's fantastically cheap. Only $18. In comparison, most full key keyboards or ergonomic ones goes from $30 to $50. This keyboard is very thin. About 1 cm high. This keyboard is also light weight. Like all flat keyboards, it's basically noise-less, with quick response because of the shallow keys. I also love the way the keys alignment are curved. It's got some ergonomic advantage of split keyboards, but kept in one piece. In my opinion, if you judge by the ratio of performance/price, then this definitely beats all Microsoft keyboards out there, and all other keyboard that exists, period. Judging strictly on product performance regardless of price, between the above 2, i find it to be a tie. However, i might consider this Comfort Curve 2000 even beating both. This seems impossible to believe, since the Comfort Curve is not fully split ergonomic, and i'm a ergonomic split-keyboard fan. Also, this keyboard is flat keys, which is generally considered not good for prolonged typing. However, i do find this keyboard extremely comfortable and faster to type, especially for using Emacs. All things considered, this is absolutely a fantastic keyboard. Just discovered this, that this keyboard's keys are prone to failure. I recommended this keyboard to a online friend about half a year ago. She told me she had some problem with some keys, said that she spilled drink on it. And she bought a new one, same model, and that too, keys started failing. Now she's on her 3rd one, and keys also fail. At first i thought maybe spilling drinks on the keyboard is the problem, even though i thought minor spilling shouldn't be a problem. Unless you pour drinks onto the key, a few splash of liquid usually won't even get into the electronic parts in modern keyboards. But key failing after the 3rd keyboard?? But recently, i noticed that some keys started to fail too. The first time this happened is the F10 key. For some reason it worked the next day. But today, the Enter key wasn't working for a while, now the key x fails sometimes. It's not consistent failure. Sometimes it works perfectly, but the next minute it won't, doesn't matter how hard you press the key or how many times you press. Not single character will show. I went to read amazon's 1-star comments. You see a lot comments about failing keys. So, this is a serious defect with this keyboard. Of all things about a keyboard, if the keys start to fail, it's the worst.